The art of tonal dressing – matching garments of similar shades – is not as simple as it looks. Here’s how to get it right. 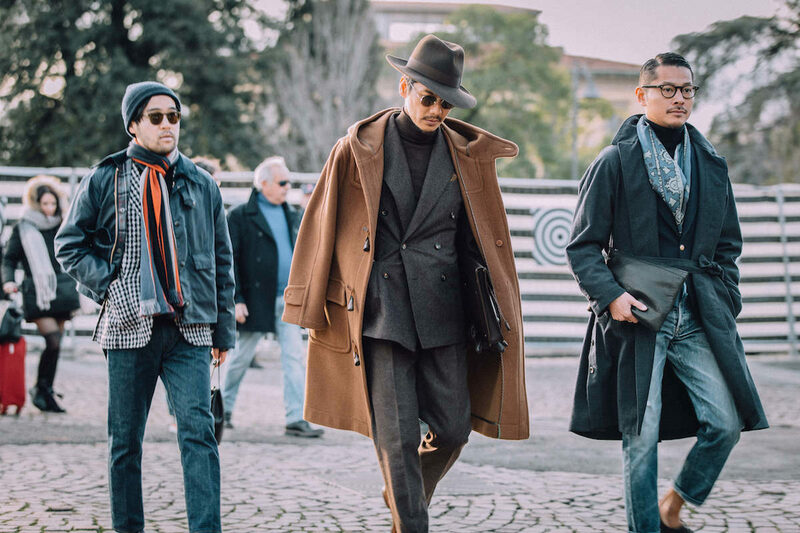 BEAMS Fashion Director Shuhei Nishiguchi showcasing how brown tonal tailoring is done with a duffle coat hanging across his shoulders at Pitti Uomo 93. Photograph by Jamie Ferguson. Used in a sartorial context, the word ‘sprezzatura’ – which was coined in 1528 by Italian Renaissance polymath Baldassarre Castiglione in The Book of the Courtier to describe “a certain nonchalance, so as to conceal all art” - is beset with paradox. Effortless elegance is evidently an attainable reality; affected nonchalance is clearly a contradiction in terms; the difference between the two is impossible to ascertain without the kind of mind-probe technology that, once invented, will only be utilised by government agencies and nefarious criminal masterminds. Certainly, those celebrated Pitti Peacocks – resplendent in their brassy alkecks, jaunty hats and pocket parachutes, rolled-up newspapers held aloft in the hope of catching the attention of passing street-style photog…. Sorry, taxi cabs, would hope to be judged on the right side of the line. But arguably, a vastly more profound, authentic nonchalance par excellence can arguably be achieved by ditching the imperious patterns, quirky affectations and bolder-than-thou juxtapositions of colour in favour of tonal dressing: matching garments of similar shade, such as pearl grey with charcoal or eggshell blue with navy. Whether opting for a formal or casual ensemble, all experts we consulted agreed that attention to texture is key. “The subtle gloss of pebble grey silk crepe de chine against grey cashmere is exquisite, even when the shades are the same,” Clarke points out, adding that there’s also merit in contrasting matt and shine effects: “Black patent leather trim against black cashmere, or suede or even a metallic surface with a knitted wool or flannel, adds depth to a colour combo,” he says. “It’s important to mix and contrast fabrics - a cashmere blazer with an Alpaca overcoat, perhaps, or a knitted silk tie with a flannel shirt,” Modoo agrees, although he suggests “treading carefully when wearing tonal shirts and ties”, adding: “Avoid anything shiny – anything that’s more Chris Tarrant than Peter Wyngarde.” Rubinacci concurs, pointing out that seasonal alignment is also paramount. “You can’t pair linen with corduroy – whereas corduroy with flannel or cashmere works,” he says. “Winter fabrics goes with winter fabrics, summer with summer - linen with cotton, for example.” Take a look at how powerfully an Edward Sexton charcoal cashmere rollneck combines with Orazio Luciano’s grey chalkstripe flannel wool two-piece suit – a collaboration with Vitale Barberis Canonico, and part of The Rake’s ‘Flâneur Collection’ - and it’s hard to disagree. Luca Rubinacci, meanwhile, has his own approach to keeping up the sartorial swashbuckling when putting together an ensemble that is, colour-wise at least, conservative: “It’s good to express your soul with a suit lining,” he says, revealing one that depicts, with a notable indifference to chromatic inhibition, Admiral Nelson's flagship The Victory. We could not applaud more heartily: while the word sprezzatura will always be fraught with incongruity, phrase ‘stealth flamboyance’ is not, and will never be, an oxymoron. Joel Edgerton wears a navy blue virgin wool, single-breasted suit, Giorgio Armani; navy brushed cotton shirt, Drake’s; charcoal-grey silk tie, Thom Sweeney; white cotton pocket-handkerchief, Emma Willis; L.U.C 1937 classic stainless-steel timepiece, Chopard. Photograph by Gavin Bond.